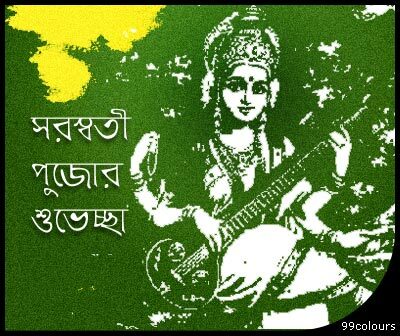 Basant Panchami is a Hindu festival celebrating Saraswati, the goddess of knowledge, music and art. It is celebrated every year on the fifth day (Panchami) of the Indian month Magh (January-February), the first day of spring. Traditionally during this festival children are taught to write their first words; brahmins are fed; ancestor worship (Pitr-tarpan) is performed; the god of love Kamadeva is worshipped; and most educational institutions organise special prayer for Saraswati. The color yellow also plays an important role in this festival, in that people usually wear yellow garments, Saraswati is worshipped dressed in yellow, and yellow sweets are consumed within the families. Children love flying kites . They enjoy the festival with great fun and enthusiasm.